The P-Series Load Rite tritoon trailer is the latest evolution in Load Rite’s production of highly corrosion-resistant, supremely adjustable, and feature-filled trailers to fulfill the trailering needs of most any tritoon boat design currently available. Each Load Rite tritoon trailer features a galvanized steel frame for superior anti-corrosion protection and ultimate service life. Steel is an excellent material for boat trailer construction but when unprotected, or even traditionally painted, and exposed to water steel tends to corrode and diminish in strength over time. Galvanization slows that process to a glacial crawl allowing a galvanized steel trailer to outlive a painted counterpart by many lifetimes. 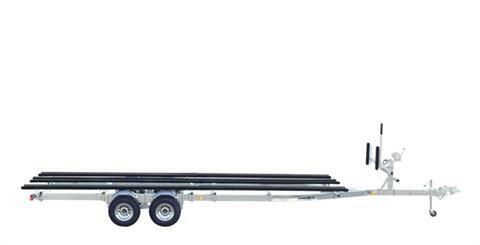 Every Load Rite tritoon trailer is engineered with great features like galvanized torsion axle suspension(1) for a long-lasting, smooth and quite ride. Where brakes are required, Load Rite tritoon trailers come standard with smooth stopping disc brakes which also offer the benefits of being self-cleaning and adjusting. This all means much less maintenance and more time on the water for every Load Rite tritoon trailer owner. Some other standard features on all Load Rite tritoon models are: full-length, adjustable, carpeted main bunks; full-length, adjustable, carpeted center bunks; winchstand with carpeted bunks, two slip-resistant steps, and a safety handrail; bead-balanced tires on galvanized wheels; manual winch and tongue jack. Load Rite offers a wide range of options to elevate any P-Series Load Rite tritoon to unrivaled levels of service and convenience.